Here’s another entry in my series on old cartoon characters. Tying into my posts on the Flintstones (and my enjoyment of superheroes), here’s an entry on Captain Caveman. 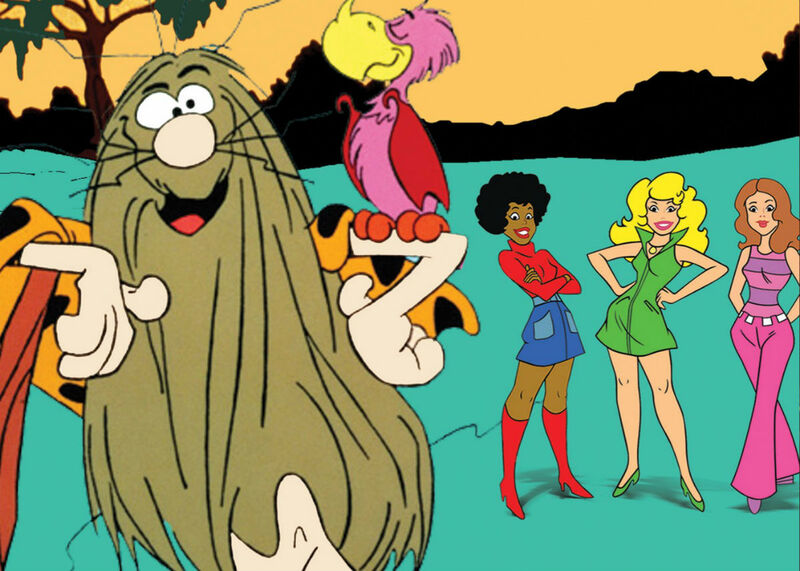 Captain Caveman, or “Cavey” as he was nicknamed, first appeared in the late 70s on the series “Captain Caveman and the Teen Angels.” The show aired initially as part of the anthology series “Laff-A-Lympics” (and later was syndicated as its own show). Like most of Hanna-Barbera’s output in the 70s, this was yet another “teens solving mysteries” Scooby-Doo-clone, but throwing “Charlie’s Angels” into the mix. Finally, of course, was the obligatory wacky Scooby-style sidekick. In this case, the “world’s first superhero,” Captain Caveman (voiced by Mel Blanc). He’s a caveman from prehistoric times thawed from a block of ice found by the Teen Angels. Cavey stayed in a miniature cave on top of the Angels’ van. Similar to “Scooby-Doo,” the group solve a mystery in each episode. Setting this show apart from the other Scooby clones (and cartoons of its era in general) might be that it’s of the few older cartoon series with female protagonists, Cavey receiving top billing aside. While Captain Caveman was the one who usually captured the villain at the episode’s end, it was the Angels who actually solved the mysteries in question. It also might be the rare animated series from before the 80s or 90s that featured a female leader of a group. In this show’s case, the leader was usually Dee Dee or Taffy. Captain Caveman’s powers consisted of the ability to fly (with the use of his club), plus superhuman strength and the ability to pull various objects, prehistoric creatures, etc. out of his “Cousin It”-style hair. He also had in his club various Flintstone-style Stone Age devices (such as a firefly-powered x-ray, a bird-powered “flashlight”/drill/etc., and so forth). Unfortunately for Cavey (but fortunately for the writers), his flight and strength powers often would give out at inopportune times. Cavey himself always spoke with a Tarzan-style voice. Cavey and the Angels also made appearances simultaneously in “Laff-a-Lympics” (as contestants on Scooby-Doo’s team). After both shows ran their course, the Teen Angels fell from use, with few appearances since. However, Captain Caveman stuck around through the 80s in several Flintstones spinoffs. The first of these was “The Flintstone Comedy Show,” which ran on NBC from 1980-1982. Here, Cavey starred in his own segment as Bedrock’s resident superhero, retconning him into the Flintstones’ setting. A “Teen Angels” episode previously featured a time-travel trip back to Cavey’s time. However, it showed his parents as living in an isolated valley where his father was the chief of Cavey’s tribe of also-hair-covered cavemen. Given Cavey’s club’s Flintstone-style devices, it could be assumed Cavey’s tribe’s valley was just some distance from Bedrock. This series was a loose parody of Superman. Cavey fought crime against various villains. He also possessed a secret identity of “Chester,” a copy boy for the “Daily Granite,” a Bedrock newspaper. Cavey’s coworkers included Wilma Flintstone and Betty Rubble. Wilma and Betty were investigative reporters similar to Lois Lane. The two got into various scrapes while investigating the villain of the episode, often requiring Cavey’s help. Seen for the first time in this series was Cavey’s own headquarters, named “Cave Central” (and resembling the Batcave). In the tradition of Spike and Tyke, Auggie Doggie and Doggy Daddy, and other cartoon characters with offspring (but apparently no wives), Cavey got his own grade-school aged son and sidekick, Cavey Junior. Unlike his father, Cavey Jr. spoke perfect English, and seemed somewhat smarter than his father. Still, Cavey Jr. greatly admired his Dad. Cave Central from the previous series appears (though unnamed) as the home to the father-and-son crimefighting duo. We also saw as recurring characters the mayor of Bedrock (an African-American woman) and Bedrock’s police commissioner. Cavey also had an archvillain, the malevolent, antisocial Mr. Bad. Cavey’s segment was presented as an after-school TV show that young “Freddy” Flintstone, Barney, etc. liked to watch. Finally, the series gave an origin story for Cavey himself. It revealed he started out fighting crime as a grade-schooler a la Superboy. Post-“Flintstone Kids,” Cavey appeared in a few episodes of Adult Swim’s “Harvey Birdman.” One episode saw Cavey sues Cavey Jr.’s school over denying teaching his son about evolution.